This is a photo of the 3rd year taken in, I think, 1959. Back row (Left to Right): George Pirie, Sandy Adams, Stuart MacPherson, Billy Munro, Derek Graham, Michael Borley, Gordon Peterson, David Munro. Middle row (left to Right): Ealanor MacIntosh, Yvonne Hillis, Fiona Strachan, Grant Boyd, Alfred Coutts, Alistair MacKay, Catherine MacMenamie, Michael Rodgers, Jennifer Ross, Shirley Martin. Front row (left to Right): Lesley Edmedes, Elizabeth Urquhart, Francis ORiley, Rhoda MacKenzie, Helen Hubbard, Sheila MacKenzie, Maureen Harwood, Jane Legge, Elizabeth Fulton, Sandra Ross, Fiona Urquhart, Shirley MacPherson. This is the class of 1957-58. My mom, Yvonne MacKenzie (Hillis) left school in 1958. Nice to see this photo Michaela, I remember your Mum well although she was a few years younger than me. I also knew your Granny, Nancy and your great-granny. If my memory serves me right they lived at the junction of King Street and Outram Street. No doubt someone (probably Harry or Doug) will put me right on that one..
Hi Rosalie. Yes Yvonne did live on the corner of Outram St and King Street. Harry, you may not be too far out as at the corner house with Ross street and Outram street beside the Masonic Lodge stayed the Gillies Family ..I remember working with Robert Gillies when I served my apprenticeship at Taylors Garage. I can remember that on the northside of King St and Outram St the corner house (next door to where we lived) lived Bunty Bell and her daughter Nancy Bell. The Gillies lived on the corner where Angelo's house was next corner from Ian Douglas. Hello Michaela, I grew up with your mum and dad. Ashley and his family lived on Ord Farm as did I, and Yvonne lived in Saltburn. The last time I heard from them was when my mum passed away in Feb. 1985. I did reply but did not hear from them again. Could you please pass on my good wishes to them and other family members? I was known as Janith in those days. 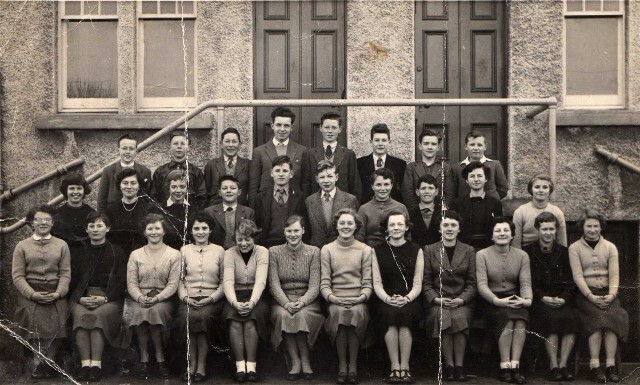 Have just found my mum Rhoda Mackenzie in the front row - she never changed!